When snowflakes dance in the sky and create a wonderful winter landscape, it is time to have some fun on the snow. In addition to well-maintained ski runs, many other winter activities await you in Slovenia. Enter the world of unforgettable adventures on snow and ice. Slovenian ski resorts offer fun in the snow for all generations. Regardless of your physical fitness and skiing skills, you can find excellent slopes that are just right for you. Beginners can learn their first turns in one of the many skiing schools, and children can learn how to ski through fun games and with the encouragement of local fairytale heroes. Snowboarders and freestyle skiers can enjoy adrenaline-filled adventures in snow parks, where various facilities for winter shenanigans await you. 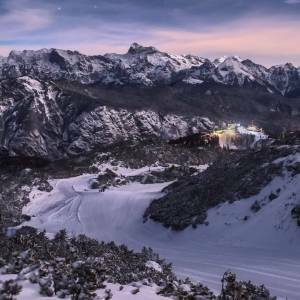 Most of Slovenia’s ski resorts will take your breath away with stunning views of the surrounding peaks and valleys. When snow covers meadows, fields and forests, cross-country skiing trails are arranged in many places around Slovenia. Well-maintained cross-country skiing trails can be found in the vicinity of ski resorts and in the midst of unspoilt nature. Exploring a snow-covered landscape on cross-country skis is a special experience that can be enjoyed by the whole family. Night-time cross-country skiing on well-maintained and lit trails has a special charm. If you like cross-country skiing challenges, find trails on which even world-class athletes train and compete. In Slovenia, you can go cross-country skiing even in the summer. What can be more tempting than to enjoy a winter fairytale landscape far away from the hustle and bustle of the city. Put on snowshoes and venture on a walk across blindingly white snow. Trudge your way among the dreamy herdsmen’s cottages in Velika Planina, and explore unspoiled snowy spots near Bled and Bohinj. 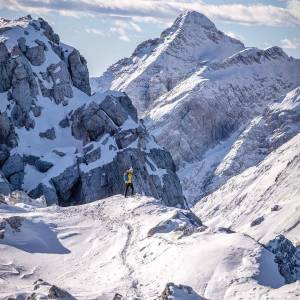 Discover the beauty of the snow-clad mountain world surrounding Bovec and Kranjska Gora. 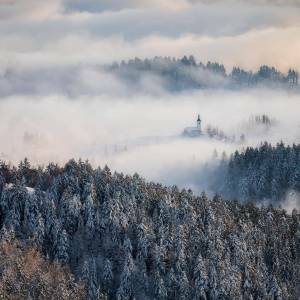 Enjoy the winter idyll while walking in Golte, Rogla, Krvavec, Kope and Pohorje. 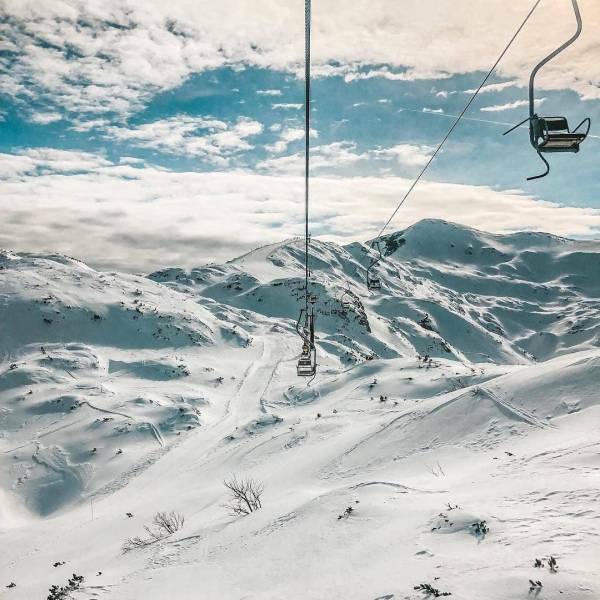 Peace and quiet far away from the commotion of the maintained ski runs: though the ascent is enjoyable, nothing beats the experience of descending on intact white slopes – this is paradise for ski tourers. The best locations for ski tours can be found in Jezersko, the Logar Valley, and on the peaks surrounding Tržič. A true mecca for tour and free skiers and snowboarders is Kanin. See the beauty of the Julian Alps and rest your eyes on the mighty Mt Triglav and Lake Bohinj from Vogel. Excellent starting points for ski touring are the slopes surrounding Kranjska Gora, Pokljuka, Krvavec and Golte. But be careful – to safely enjoy the snowy slopes, first check the snow and weather conditions. Do you crave winter adventures, which will get your adrenaline going? Enjoy an unforgettable ride on a snowmobile or a dog sleigh in Rogla; skijoring is also something special. Ride a snowbike or descend along the snowy surface on a mountain bike. Biking adventures on snow await you in Kranjska Gora and Krvavec. 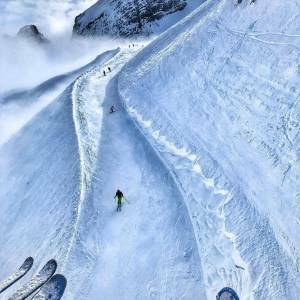 Descend on a snow raft in Bohinj on lumps and bumps of snow-covered slopes. For those who prefer climbing steep slopes rather than staying on solid ground, there are a few natural and artificial waterfalls where ice climbing is possible. While observing suitable winter conditions, you can engage in ice climbing on frozen waterfalls; the most known ones are in the Tamar Valley and near Martuljek, in the Trenta Valley and the Logar Valley. A favourite artificial ice climbing spot is the Mlačca Gorge near Mojstrana. Sledding is one of the most popular activities on snow for all generations. It is possible to descend from a hill on a sleigh in almost every part of Slovenia. Venture down the slopes of Velika Planina, and discover popular sledding terrains in Pokljuka, Soriška Planina and in the vicinity of Bohinj. Enjoy the view of the thousands of Ljubljana city lights as seen from Krvavec. The excitement of sledding will also overcome you in Kranjska Gora, Golte, Rogla, Pohorje and many other places. When temperatures drop below freezing for several consecutive days, ice is formed on lakes, and when the layer of ice is thick enough, it becomes an excellent ice skating surface, where we can enjoy nature and also do something good for our health. One of the most popular natural ice skating locations is Lake Planšarsko jezero in Jezersko, where the surrounding hills and mountains add extra charm to the activities on ice. A special experience is also ice skating or merely a walk on the ice-covered Lake Bled all the way to the island, but only when the ice is thick enough. Ice skating in the natural environment presented by Lake Cerknica is also exceptional. Lake Jasna in Kranjska Gora is a natural ice skating site located next to the road leading to the Vršič Pass. To spite unpredictable winter weather and provide the opportunity to have fun on ice to as many residents and visitors as possible, ice skating rinks are being set up in many tourist towns and cities, where it is possible to listen to music while skating and later warm up with hot beverages. Enjoy frolicking in the snow. After winter activities, relax in Slovenian spas and health resorts, and regain your strength with a delicious feast.